Everyone’s favorite alien-megastructure-that-never-was got another affirmation that it’s just a goddamn star today. According to SETI, there are NO EXTRATERRESTRIAL LASERS emanating from the baffling stellar body. That’s right—no laser pulses beaming at the Earth from star KIC8462852! Believe it or not, this is a real thing that SETI researchers say we might expect to see if an intelligent civilization of technological prowess far surpassing our own were to try and communicate with these here primeval meatbags. Alas, it is not so, according to new research submitted to The Astrophysical Journal that appears in pre-print today on arXiv. The observations that ruled out this idea were made on six nights between October 29th and November 28th at the Boquete Optical SETI Observatory in Panama. This observatory’s telescope is highly attuned to tiny, pulsed signals—as short as a billionth of a billionth of a second—such as those our future alien overlords might send our way if they wanted to forewarn us of the coming invasion. (Well, technically, they would have been warning the Roman Empire—those signals take about 1,500 years to reach Earth). 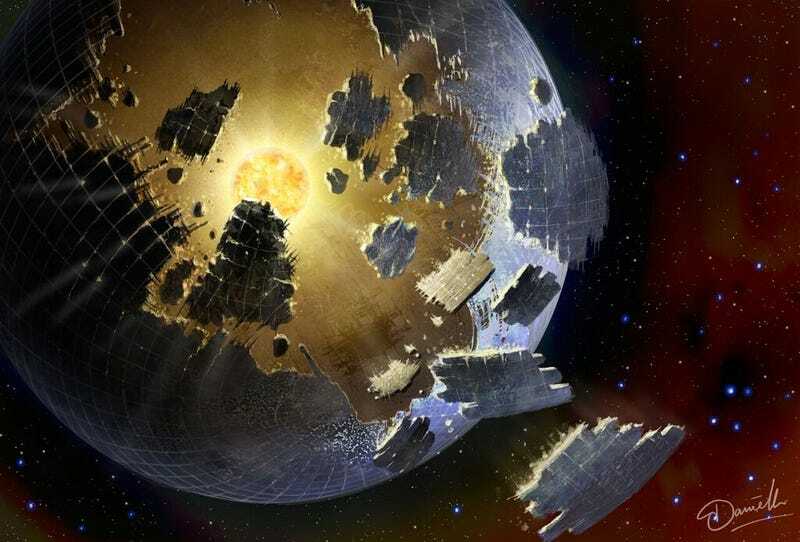 The star known as KIC 8462852 first hit the public radar in October. Astronomer Jason Wright casually suggested that its irregular, flickering pattern, so unlike anything else we’ve observed with the Kepler space telescope, might be explained by an alien megastructure—a swarm of giant space panels built to harness the entire energetic output of their star. It’s a twist on the classic Dyson sphere concept, first proposed by Freeman Dyson decades ago. The notion electrified the media and the public, mobilizing a worldwide search for additional signs that KIC 8462852 might be the bright beacon that ends our cosmic loneliness. That search has proceeded very quickly, and the results have been resoundingly clear: this star ain’t got aliens. As I reported back in November, astronomers using the Allen Telescope Array in the Cascade mountains conducted a thorough search for narrow and broadband signals, which would indicate the technobabble of an advanced civilization. They found nothing of interest. Now we know that the fabled aliens swarming KIC 8452852 aren’t trying to communicate with us via laser pulses, either. If not aliens, what in the sweet mother of mercy is behind this infuriatingly flickering star? In all likelihood, there’s a natural explanation. Perhaps the shape of the star itself is highly distorted, or it’s being orbited by a swarm of cometary fragments. Still, I think just to be extra safe, we should get a closer look at this thing and make sure there isn’t a giant space armadillo shooting off SOS flares. Can’t be too careful.